Which luxury cruise line is building five new ships, serves its guests Veuve Clicquot Champagne and Ladurée Macarons -- and will soon offer a unique multi-sensory underwater lounge called the Blue Eye? It’s the same line that has been a leader in expedition cruising since 1999 and offers annual sailings to the Antarctic, the Arctic and practically everywhere in between. 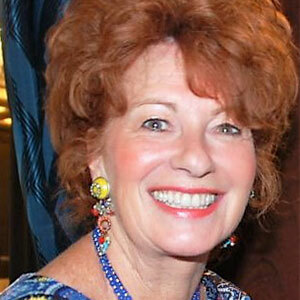 And one that sources more than 90% of its business via the travel professional – a heartening number to see. 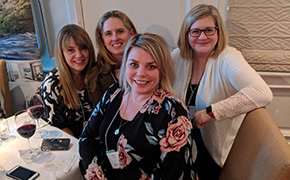 The answer is Ponant Yacht Cruises and Expeditions, and when senior company executives were in Toronto recently I had the pleasure of hosting an event for travel agency partners. 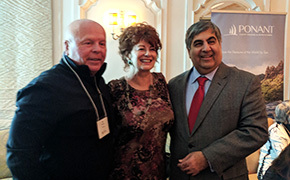 Navin Sawhney, the incredibly eloquent and knowledgeable CEO of the Americas for the only French-flagged cruise line, gave a fascinating presentation about the growth of the company and the arrival this year and next, of four Explorer yachts, all sisters, which will join the current 5-ship fleet. This is impressive expansion to say the least. 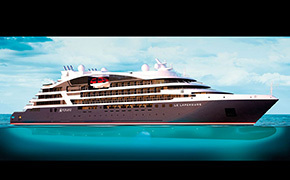 Then, in 2021, Ponant will launch another cruise game-changer with the first electric hybrid icebreaker ship propelled by Liquefied Natural Gas (LNG). With just 135 staterooms, this innovative vessel will sail to places almost beyond imagination -- including the true geographic North Pole. 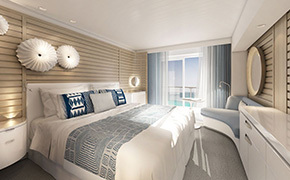 The current focus for Ponant is the launch of the four Explorer ships, each with 92 staterooms and suites, all with balconies. The onboard atmosphere is inclusive, with all gratuities, wines, cocktails and other beverages included in the cruise fare. The first two yachts named Le Lapérouse and Le Champlain launch in June and October this year and 2019 will bring Le Bougainville in March and Le Dumont D’Urville in June. All are geared for expedition cruising in both the Antarctic and the Arctic as well as in the exotics and a range of other global destinations including South America, Japan and the Russian Far East, the Med, Africa, North America, Australia and New Zealand, the Amazon, Greek Isles and many more. The four yachts will offer the remarkable opportunity for guests to experience the underwater lounge named the Blue Eye and become modern-day underwater explorers. 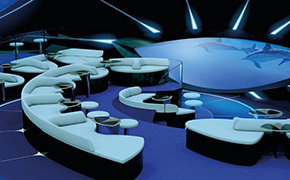 Accommodating just 45 guests at a time (but with ample opportunity for every guest to enjoy on each cruise), this multi-sensory space is located in the hull beneath the waterline and offers technology that will bring the flora, fauna and marine life of the deep a little closer to each guest. It has to be seen to be believed and there’s also a bar down there – so sip on champagne and discover a new experience. This is also a great spot for a group or incentive kick-off cocktail party! The other big news from Ponant is the launch of its ‘Quintessential Collection’ series of itineraries, designed for discerning travellers who want to do more than just cruise. As Navin colourfully describes it, these sailings are for those who want to be enriched and inspired -- to not just be sightseeing or sight-doing, but sight-being. A selection of dates are now available. Themes include a Gardening Cruise with internationally recognized horticulturalist Holly Shimizu, a Sicilian Food and Wine experience that circumnavigates the Med’s biggest island, and, one of my favourites, an October 2019 Global Affairs themed cruise featuring CNN’s Fareed Zakaria and travelling from Valletta to Athens. These kind of cruises are great group opportunities or even half-ship charters and will, I am sure, prove to be exceedingly popular. There’s also a World War II History Cruise, one to the Antarctica in later 2019 that focuses on climate change and others that feature music, art and architecture. The Ponant onboard experience is charming and upscale, yet still casual with a natural Gallic elegance and announcements in both French and English. The guest makeup is about 40% French-speaking with the balance a global mix, including a North American cohort that is growing quickly. Add some Brits and Aussies and a sprinkling of other nationalities and you have an enjoyable and interesting mix of worldly guests. This upscale, deluxe cruise company is definitely going places. both literally and figuratively, and offers a wide range of cruise experiences and price points. The leader in luxury expedition cruising – with a 50% market share – Ponant is definitely worth checking out.